Massachusetts became a state February 6, 1788, the 6th state admitted to the Union. 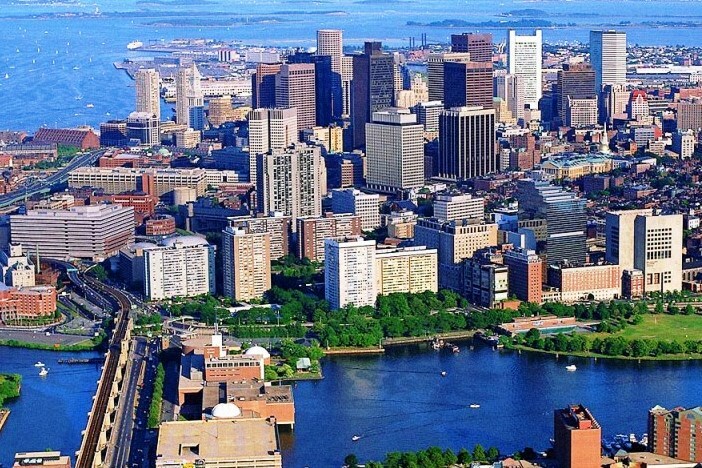 Boston is an old and very historical city, founded in 1630. The American Revolution began here. The Midnight Ride of Paul Revere, the Boston Tea Party, and the Battle of Bunker Hill were important to the beginning of the United States, and the ending of the colonies. The State House, or capitol, was built in 1795 by Charles Bullfinch, the nation’s first professional architect. Other historical buildings in Boston are the Old State House, where the Declaration of Independence was first proclaimed to the citizens of Boston, and Faneuil Hall, where mass meetings were held during pre-Revolutionary time. Follow the Freedom Trail to see all these things and Old Ironsides, the oldest Navy ship afloat in the world (1797). Also famous are Boston Baked Beans, Fenway Park, and the Red Sox. The Boston Common; the River Charles, and Harvard Square; the cemeteries with Franklin names; the beans, the cod, the accent that turns hard to hod; the sailing ships, the sea; the houses with the black enamel doors on classy Beacon Street. Mountains near: Appalachian, Berkshires, Taconic. Mount Greylock, in the northwest corner of the state, is the highest point in Massachusetts at 3,491 feet.